The human cathelicidin peptide LL-37 is a multifunctional immunomodulatory and antimicrobial host defense peptide of the human immune system. LL-37 modulates host cell responses to microbial stimuli and also affects the action of other endogenous immune mediators such as IL-1β and GM-CSF. This activity of LL-37 is known to be complex, with the functional outcomes being dependent on the cell type and activation status, timing of exposure, and other immune mediators present. It was demonstrated in this study that LL-37 inhibited cellular responses to IFN-γ, the key cytokine of Th1-polarized immunity. The inhibitory activity of LL-37 on IFN-γ responses was characterized in monocytes, macrophages, dendritic cells, and B lymphocytes, showing suppression of cell activation, proliferation, and production of proinflammatory and Th1-polarizing cytokines, and Abs. It was further shown that in monocytes the suppressive effects of LL-37 were mediated through inhibition of STAT1-independent signaling events, involving both the p65 subunit of NF-κB and p38 MAPK. This study suggests that LL-37 modulates IFN-γ responses during both the innate and adaptive phases of immune responses, indicating a new immunomodulatory role for this endogenous peptide. These effects on IFN-γ activity should be taken into consideration in the development of cathelicidin-based peptides for therapeutic applications as immunomodulatory or microbicidal agents. The cathelicidin LL-37 is a multifunctional immunomodulatory peptide of the human immune system (1, 2, 3). It is produced by proteolytic cleavage of the precursor human cathelicidin antimicrobial protein 18 kDa, primarily after secretion or release from leukocytes, cells of mucosal epithelia, and keratinocytes, and is found at concentrations of 2–5 μg/ml in many human tissues, surfaces, and fluids, and at higher concentrations in inflammatory diseases or situations. LL-37 exerts a wide range of biological effects, including weak direct antimicrobial and chemotactic functions (4, 5), the induction of more potent chemokines and other molecules involved in cell communication and motility (6), stimulation of mast cell degranulation (7), promotion of antimicrobial functions of neutrophils (8), modulation of cell survival and apoptosis (9, 10), and many others. Although most of these effects have been well characterized in stringently controlled in vitro systems, the activities of LL-37 in complex biological environments in the presence of other immune mediators are only beginning to be characterized, although many of these basic immunomodulatory functions have been observed in vivo. From recent studies, it is becoming apparent that the regulation of cellular responses to microbial compounds and endogenous immune mediators is an important aspect of LL-37 activity. Activation of APCs by microbial stimuli plays a key role in the induction of innate immune responses and in the establishment of long-term adaptive immunity (11); thus, there has been much interest in the effects of LL-37 on the responses of APCs and other leukocytes to microbial compounds. Many studies have shown this activity to be complex and highly dependent on the cell type and stimulus used. LL-37 is known to inhibit monocyte responses to LPS, selectively down-regulating production of proinflammatory cytokines such as TNF-α (6). This correlates with its protective activity in animal models of endotoxemia (12), and indicates that at least in some physiological settings LL-37 may function to regulate and dampen inflammation. LL-37 also suppresses the effects of LPS and other TLR ligands, such as lipoteichoic acid (LTA)4 and flagellin, on monocyte-derived dendritic cells, inhibiting activation, cytokine production, and costimulatory activity (13, 14). However, the effects of LL-37 on cellular responses to microbial signals are not always antagonistic. LL-37 promotes the responses of bone marrow-derived dendritic cells to peptidoglycan and lipopeptides (13), and also the responses of blood mononuclear cells and plasmacytoid dendritic cells to CpG oligonucleotides (6, 15). The timing of LL-37 exposure also influences its functional consequences, with LL-37 pretreatment of monocytes enhancing monocyte-derived dendritic cell functions, including IL-12 secretion and Th1-polarized costimulatory activity (16), whereas simultaneous treatment of immature dendritic cells with LL-37 and TLR ligands inhibits dendritic cell maturation (13, 14). Microbial compounds, such as TLR ligands, induce the production of a multitude of endogenous immune mediators that act to stimulate, regulate, and polarize the immune response (17). Thus, the overall host response to microbial danger signals represents a complex combination of the response to the pathogen and the response to the activity of immune mediators induced by pathogen signature molecules. Although the effects of LL-37 on direct responses to microbial compounds have now been widely investigated, there have been limited studies of the effects of LL-37 on cellular responses to host immune mediators. We and others have previously shown that LL-37 augments responses to the growth factor GM-CSF and cytokine IL-1β in human monocytes, synergistically boosting signaling pathway activation and chemokine production (18, 19). However, the effects of LL-37 on the activities of other cytokines in different cell types have not been studied. IFN-γ is one of the key cytokines in the immune response to intracellular pathogens, in antitumor immunity (20, 21), and in the pathology of a number of inflammatory diseases (22, 23, 24, 25, 26, 27, 28). During the early innate phases of the immune response, IFN-γ is primarily produced by NK, NK-T, and γδ T cells, whereas activated Th1-polarized T cells are the main source of IFN-γ in adaptive immunity. IFN-γ acts through a ubiquitously expressed heterodimeric IFN-γ receptor, and the JAK-STAT signaling pathway, leading to the phosphorylation, dimerization, and nuclear translocation of the STAT1 transcriptional regulator (29), and also induces the activation of a number of other STAT1-independent signaling responses (30, 31). IFN-γ stimulates antimicrobial and Ag-presenting activities of leukocytes, inducing the production of proinflammatory and Th1-polarizing cytokines, the expression of costimulatory molecules, and the MHC class I pathway of Ag processing and presentation. Overall, IFN-γ promotes classical activation of macrophages (32), maturation of dendritic cells, and activation of Th1-polarized adaptive immunity (33). IFN-γ also has direct activity on B cells, promoting proliferation and plasma cell differentiation, and regulating Ab class switching (34, 35). Furthermore, many of the activities of IFN-γ synergize with TLR ligands, such as LPS (36, 37, 38). We previously reported in brief that LL-37 suppressed the IFN-γ-mediated induction of IL-6 in human PBMCs (18). We hypothesized in this study that LL-37 might have a broader role in modulating cellular responses to IFN-γ during both innate and adaptive phases of immune response, and this might be an important component of its wider activity in regulating and dampening excessive inflammation. In the current study, we provide a comprehensive characterization of the effects of LL-37 on IFN-γ responses, alone and in combination with LPS, on APCs, including monocytes, macrophages, dendritic cells, and B cells. The data demonstrate that LL-37 suppressed a wide range of IFN-γ responses in a variety of cell types, and that at least in monocytes this activity was mediated through suppression of STAT1-independent signaling events. PBMCs were isolated, as previously described (6). Briefly, venous blood was collected from healthy volunteers into heparin-containing Vacutainer tubes (BD Biosciences) in accordance with the ethical approval guidelines of the University of British Columbia Research Ethics Board. The blood was diluted 1/1 in PBS (pH 7.4; Invitrogen) and separated by density gradient centrifugation over Ficoll-Paque Plus (Amersham Biosciences). The mononuclear cell layer was collected, washed twice in PBS, and counted using a trypan blue exclusion method. The cells were seeded at 1 × 106 cells/ml in RPMI 1640 supplemented with 10% (v/v) heat-inactivated FCS, 2 mM l-glutamine, and 1 mM sodium pyruvate (all from Invitrogen), and maintained in a humidified incubator at 37°C and 5% CO2. Mouse splenocytes were maintained in the same conditions, with further addition of 100 μg/ml streptomycin, 100 U/ml penicillin (Invitrogen), and 50 μM 2-ME (Sigma-Aldrich) to the medium. RAW/pIL12-GFP cell line, a gift of W. Jacobs (Albert Einstein College of Medicine, New York, NY), is a RAW 264.7 mouse macrophage cell line (ATCC TIB-71) stably expressing GFP under the control of the mouse IL12-p40 promoter (−800 to +55) (39). The cell line was maintained in DMEM with 4.5 g/L glucose, 10% (v/v) FCS, 2 mM l-glutamine, 25 mM HEPES (all from Invitrogen), and 1 mg/ml G418 selection marker (Calbiochem). The cells were seeded in 24-well tissue culture plates at 1.5 × 105 cells/ml per well, and cultured for 24 h before stimulation. Recombinant human and mouse IFN-γ were purchased from Research Diagnostics. LPS from Pseudomonas aeruginosa strain H103 was purified using the Darveau-Hancock method, as described previously (40). Other TLR and nucleotide-binding oligomerization domain-containing 2 (NOD-2) ligands were purchased from InvivoGen, including Pam3CSK4, Staphylococcus aureus LTA, polyinosinic-polycytidylic acid, Salmonella typhimurium flagellin, imiquimod, and muramyl dipeptide (MDP). Phosphorothioate CpG oligonucleotide 10101 (TCGTCGTTTTCGCGCGCGCCG) was provided by Merial. Peptide LL-37 (LLGDFFRKSKEKIGKEFKRIVQRIKDFLRNLVPRTES) was synthesized using F-moc chemistry at the Nucleic Acid/Protein Synthesis Unit of University of British Columbia. All flow cytometry data were collected on a FACSCalibur and analyzed using CellQuest software (BD Biosciences). For the analysis of cell surface marker expression, the cells were resuspended in HBSS (pH 7.4) and supplemented with 2% FCS (Invitrogen), 0.2% (w/v) sodium azide and 20 mM HEPES. The staining was conducted at 4°C for 20 min with the following Abs: Alexa Fluor 647-conjugated anti-human CD11c and CD14 (clones 3.9 and M5E2) and anti-mouse CD86 (clone GL-1), allophycocyanin anti-mouse CD45R/B220 (clone RA3-6B2), PerCP anti-human HLA-DR (clone L243), PE anti-human CD80 and CD86 (clones 2D10 and IT2.2; all from BioLegend), and PerCP-Cy5.5 anti-mouse CD69 (clone H1.2F3; eBioscience). Lineage marker Abs were FITC or PE conjugated and purchased from ImmunoTools as part of the IT-Box 341 and IT-Box 233 sets. For the analysis of intracellular cytokine production, the cells were treated with appropriate stimuli for 18 h in the presence of Golgi-STOP inhibitor to block secretion (BD Biosciences). The cells were fixed and permeabilized using the Cytofix/Cytoperm Plus kit (BD Biosciences), according to the manufacturer’s protocol, and stained with FITC-conjugated anti-human TNF-α (clone MAb11; eBioscience) or PE anti-human IL-12 p40/p70 (BD Pharmingen), using an IgG1 isotype control (BD Pharmingen) to check for the specificity of staining. For the analysis of protein phosphorylation, the cells were stimulated over a 2-h time course, and then fixed in 2% (w/v) paraformaldehyde in PBS at room temperature for 15 min, permeabilized in 90% (v/v) methanol at 4°C for 20 min, and washed twice in 0.5% (w/v) BSA in PBS. The cells were stained for phospho-p38 T180/Y182 using 3D7 rabbit monoclonal or for phospho-STAT1 Y701 using rabbit polyclonal (both from Cell Signaling Technology), for 1 h at room temperature. Following washing, the cells were further stained with goat anti-rabbit IgG Alexa Fluor 647 (Invitrogen; Molecular Probes) at 2 μg/ml at room temperature for 30 min. Alternatively, cells were stained with Alexa Fluor 488-conjugated anti-phospho-STAT1 (S727, clone K51856) or anti-phospho-p65 NF-κB (S529, clone K10-895.12.50), from BD Biosciences. All the cells were counterstained with anti-human CD14-PE (clone MEM-18; from ImmunoTools). For analysis of cell proliferation, cells were loaded with CFSE at 0.5 μM using Vybrant Cell Tracer Kit (Invitrogen; Molecular Probes), according to the manufacturer’s protocol. After cell stimulation, CFSE levels in the cells were measured by flow cytometry as fluorescence intensity in the FL-1 channel. Tissue culture supernatants were centrifuged at 1000 × g for 10 min to obtain cell-free samples, and stored at −20°C. The levels of cytokines were measured by ELISA, using the following Ab pairs: clones B-T21 and C8.6 for human IL-12 p40/p70, MQ2-13A5 and MQ2-39C3 for human IL-6, MAb1 and MAb11 for human TNF-α, and 1F3F3D4 and MP6-XT22 for mouse TNF-α (all from eBioscience). For mouse Ig ELISAs, the following Ab pairs were used: clones R6-60.2 and II/41 for IgM, clones R2-38 and R40-82 for IgG3, and clone R2-40 for IgG2a (all from BD Bioscience), and an anti-mouse IgG2a rabbit polyclonal (Southern Biotechnology Associates). The ELISAs were developed with avidin HRP (eBioscience), followed by TMB Liquid Substrate System (Sigma-Aldrich), and imaged using PowerWave ×340 plate reader (Bio-Tek Instruments). Quantification was done against serial dilutions of recombinant TNF-α and IL-12 (R&D Systems) and of mouse IgM, IgG2a, and IgG3 isotype controls (BioLegend). Statistical comparisons were performed with Prism 4.0 Software (GraphPad), using two-tailed Student’s t test for comparisons of two data sets, and ANOVA for multiple comparisons. We have previously shown that LL-37 suppresses IFN-γ induced production of IL-6 in PBMCs (18). To more fully understand the effects of LL-37 on IFN-γ responses in these cells, the effects of LL-37 on the production of the proinflammatory cytokine TNF-α and Th1-polarizing cytokine IL-12 p70 were further assessed. It was observed that LL-37 (20 μg/ml) significantly inhibited TNF-α production in response to IFN-γ stimulation (Fig. 1⇓A); however, no significant IL-12 production was detected (data not shown). Maximum inhibitory activity on TNF-α production was observed at 8 h of stimulation, and LL-37 dose titration showed that the inhibitory activity was preserved at LL-37 concentrations as low as 1 and 5 μg/ml, demonstrating that the inhibitory activity is relevant at the physiological concentrations of the peptide found in tissues under noninflammatory conditions (Fig. 1⇓B). LL-37 suppression of the IFN-γ- and LPS-induced production of TNF-α and IL-12 in human PBMCs. A and C, The cells were stimulated with IFN-γ (10 ng/ml) and LPS (10 ng/ml) with or without LL-37 (20 μg/ml) for 18 h. B and D, The cells were stimulated for 2–48 h with IFN-γ (10 ng/ml) and LPS (10 ng/ml) with or without LL-37 (at 1, 5, or 20 μg/ml). E, The cells were primed with IFN-γ (10 ng/ml) for 2.5 h with or without LL-37 (20 μg/ml), and then washed and stimulated with LPS (10 ng/ml) for an additional 16 h. The data are from five independent experiments; bars represent means and SEs of the mean; ∗, p < 0.05; ∗∗, p < 0.01; ∗∗∗, p < 0.001, using Student’s t test (A, C, and E) or ANOVA (B and D). Because IFN-γ is known to augment cellular responses to TLR ligands (36, 37, 38), the effects of LL-37 on PBMC responses to a combined LPS and IFN-γ stimulation were further assessed. LL-37 almost completely blocked the synergistic induction of TNF-α and IL-12 by the combined treatment (Fig. 1⇑C). Strong inhibitory activity was observed throughout a 48-h stimulation time course and over the 1–20 μg/ml LL-37 concentration range (Fig. 1⇑D). To control for the direct antiendotoxic activity of LL-37, IFN-γ priming was investigated, in which PBMCs were treated with IFN-γ in the presence or absence of LL-37 for 2.5 h, then washed and stimulated with LPS for an additional 16 h. In this protocol, LL-37 acted only in the IFN-γ-priming phase of the stimulation, and we observed a similar strong inhibition of TNF-α and IL-12 production by LL-37 (Fig. 1⇑E). Thus, LL-37 strongly suppressed production of proinflammatory and Th1-polarizing cytokines in response to IFN-γ and LPS, and this was at least in part mediated through a direct inhibition of IFN-γ activity. The effects of LL-37 on PBMC responses to IFN-γ (10 ng/ml) in combination with other TLR ligands were also tested. LL-37 (20 μg/ml) strongly inhibited TNF-α production in response to IFN-γ and the TLR2 ligand LTA (2 μg/ml; 24-h stimulation; Fig. 2⇓A). However, it had no significant inhibitory effect on TNF-α responses to IFN-γ in combination with Pam3CSK4 (TLR1-TLR2 ligand; 1 μg/ml), flagellin (TLR5 ligand; 0.5 μg/ml), or NOD-2 ligand MDP (10 μg/ml; Fig. 2⇓A). CpG oligonucleotide 10101 (5 μg/ml), polyinosinic-polycytidylic acid (50 μg/ml), and imiquimod (10 μg/ml) did not induce significant production of TNF-α in PBMCs at 24 h of stimulation and did not affect TNF-α response to IFN-γ (data not shown). There were no additive or synergistic interactions between any of the TLR ligands and IFN-γ in IL-6 induction (data not shown); however, NOD-2 ligand MDP acted in synergy with IFN-γ in the induction of IL-6, and this response was significantly suppressed by LL-37 (Fig. 2⇓B). Effects of LL-37 on PBMC responses to IFN-γ in combination with TLR and NOD-2 ligands. The cells were stimulated with IFN-γ (10 ng/ml) and S. aureus LTA (2 μg/ml), Pam3CSK4 (1 μg/ml), S. typhimurium flagellin (0.5 μg/ml), and MDP (10 μg/ml) with or without LL-37 (20 μg/ml) for 24 h, and supernatants were analyzed for TNF-α (A) and IL-6 (B) production. The data are from ≥4 independent experiments; bars represent means and SEs of the mean; ∗∗, p < 0.01; ∗∗∗, p < 0.001 using Student’s t test. The effects of LL-37 on IFN-γ responses were studied in the different cell populations comprising PBMCs, with particular focus on APCs and their precursors. Thus, PBMCs were stimulated with IFN-γ and LPS, in the presence or absence of LL-37, and flow cytometry was used to assess the activation status of monocytes, gated by their forward scatter, side scatter, and the expression of CD14 marker. 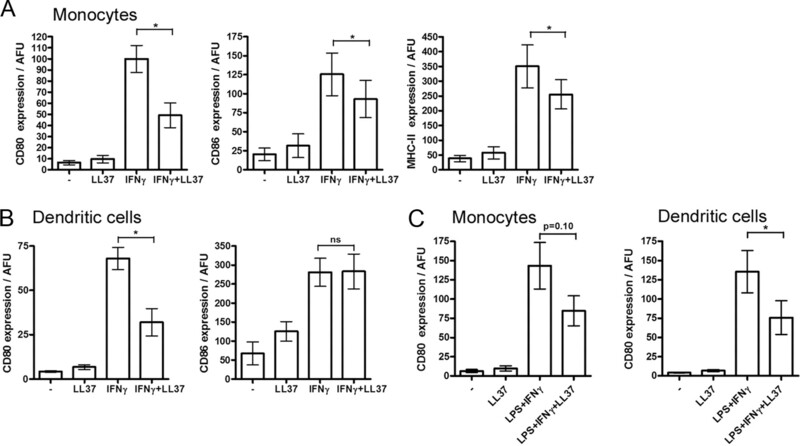 IFN-γ induced the up-regulation in monocytes of the activation markers CD80 and CD86, as well as MHC-II, and it was observed that LL-37 led to a partial, but statistically significant down-regulation of all of these responses (Fig. 3⇓A). 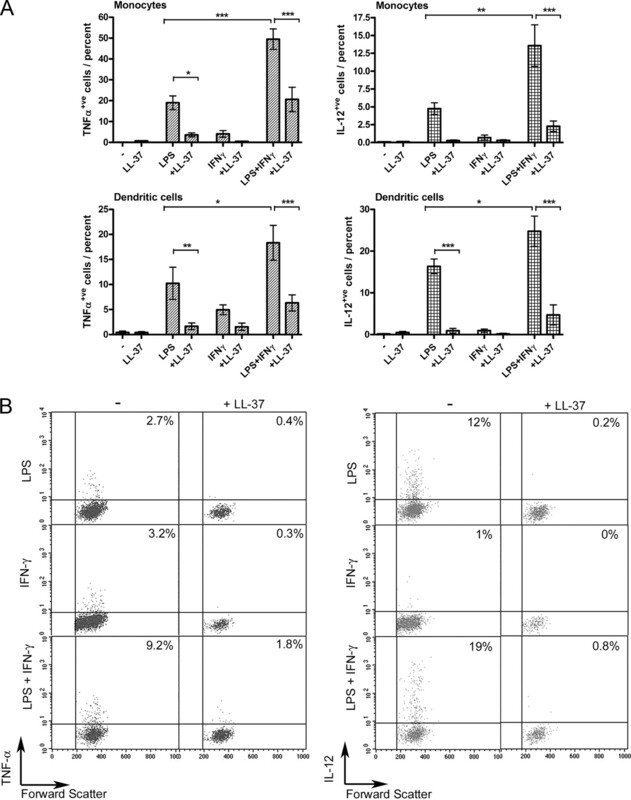 LL-37 suppression of the IFN-γ- and LPS-induced activation of monocytes (A and C) and conventional dendritic cells (B and C) in the human blood. PBMCs were stimulated for 18 h with IFN-γ (10 ng/ml) and LPS (100 ng/ml), with or without LL-37 (20 μg/ml), and analyzed for expression of CD80, CD86, and MHC-II by flow cytometry. Monocytes were gated by forward and side scatter and CD14 expression, and conventional dendritic cells were gated as lineage marker− MHC-II+ and CD11c+ cells. The data are from four independent experiments; bars represent means and SEs of the mean; AFU, arbitrary fluorescence units; ∗, p < 0.05 using Student’s t test. LL-37 effects were also assessed on the activation of blood dendritic cells, gating on these cells as lineage marker− MHC-II+ and CD11c+ (according to standard protocols; supplementary Fig. 1)5 (41). This population constituted an average of 0.3% of PBMCs. LL-37 partially inhibited the IFN-γ-induced up-regulation of CD80 on these cells; however, the up-regulation of CD86 was not affected (Fig. 3⇑B). CD80 and CD86 are known to differ in the dynamics of their induction and the relative affinities for their ligands, with CD86 being induced in the earlier phases of dendritic cell activation, whereas CD80 is induced later, but has higher affinity for both the stimulatory CD28 and the inhibitory CTLA-4 T cell ligands (42, 43). The apparent differences in the effects of LL-37 on the up-regulation of CD80 and CD86 indicated that the peptide modulated rather than broadly inhibited dendritic cell activation. The effects of LL-37 on the induction of costimulatory molecules by the combined treatment with IFN-γ and LPS were also assessed. LL-37 inhibited the induction of CD80 on monocytes and dendritic cells in response to the IFN-γ and LPS treatment (Fig. 3⇑C); however, no inhibition of CD86 or MHC-II expression was observed (data not shown). To further investigate the effects of LL-37 on IFN-γ-induced activation of monocytes and dendritic cells, the effects of the peptide on cytokine production were investigated. PBMCs were stimulated with IFN-γ and LPS, with or without LL-37, in the presence of a monensin-based inhibitor of vesicular transport, Golgi-STOP, to induce intracellular accumulation of cytokines, as per established protocols. The inhibitor was added at 1 h after the beginning of stimulation, to allow the activation of both MyD88-dependent and -independent signaling pathways downstream of TLR4 (44). The cells were analyzed by flow cytometry for the production of TNF-α and IL-12, gating on monocytes and dendritic cells, as described above. 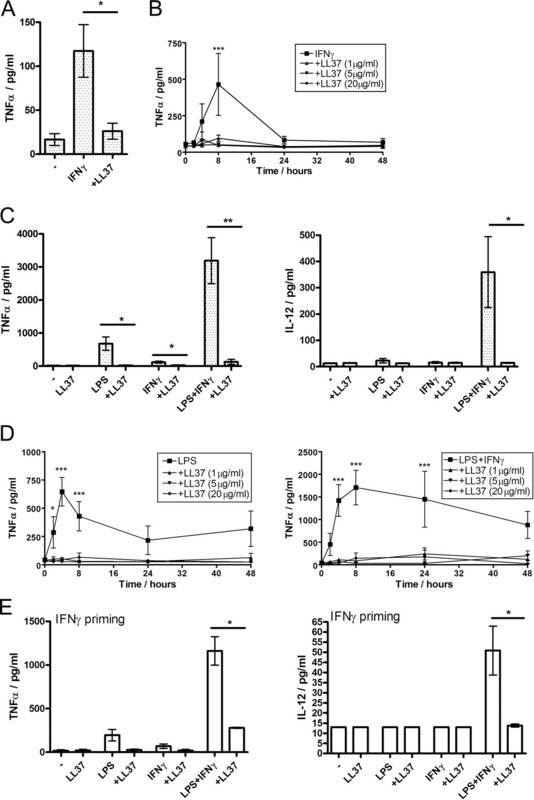 LL-37 strongly suppressed LPS-induced cytokine responses in monocytes and dendritic cells with significant down-regulation of both TNF-α and IL-12 production (Fig. 4⇓), consistent with previous reports (6, 13, 14). Furthermore, LL-37 also significantly inhibited the induction of TNF-α in monocytes and dendritic cells in response to IFN-γ (p ≤ 0.05; Student’s t test), although no consistent induction of IL-12 was observed (Fig. 4⇓; supplementary Fig. 2). The synergistic responses to the combined treatment with IFN-γ and LPS were also strongly inhibited by the peptide, with strong inhibition of both TNF-α and IL-12 production in monocytes as well as dendritic cells (Fig. 4⇓; supplementary Fig. 2). In summary, LL-37 significantly inhibited cytokine responses to IFN-γ and to the combined treatment with LPS and IFN-γ in human blood monocytes and dendritic cells. LL-37-mediated suppression of cytokine responses to IFN-γ and LPS in human blood monocytes and dendritic cells. PBMCs were stimulated for 18 h with IFN-γ (10 ng/ml) and LPS (100 ng/ml), with or without LL-37 (20 μg/ml), in the presence of Golgi-STOP protein secretion inhibitor. The cells were analyzed by flow cytometry for TNF-α and IL-12 production; monocytes were gated by forward and side scatter and CD14 expression, and conventional dendritic cells were gated as lineage marker− MHC-II+ and CD11c+ cells. A, Percentage of TNF-α- and IL-12-positive cells within the monocyte and dendritic cell gates following IFN-γ and LPS stimulation. B, Flow cytometry plots showing TNF-α and IL-12 production by dendritic cells; the percentages of TNF-α- and IL-12-positive cells within the dendritic cell gate are indicated. The data are from ≥4 independent experiments; bars represent means and SEs; ∗, p < 0.05; ∗∗, p < 0.01; ∗∗∗, p < 0.001 using ANOVA. 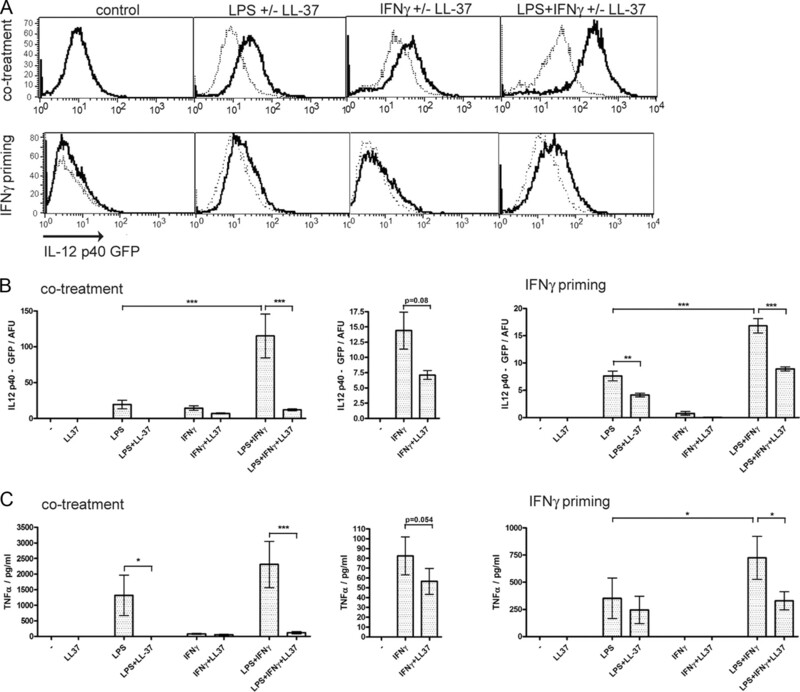 To investigate the effects of LL-37 on IFN-γ responses in macrophages, a RAW/pIL12-GFP cell line, stably expressing GFP under the control of IL12-p40 gene promoter, was used (39). As before, the cells were stimulated with IFN-γ and LPS, with or without LL-37, and induction was monitored using GFP fluorescence as a readout for IL12-p40 promoter activity. Responses to a combined treatment with IFN-γ and LPS were strongly inhibited by the peptide (Fig. 5⇓). Significant suppression was also observed in an IFN-γ-priming protocol, showing the inhibition of IFN-γ priming of macrophages by LL-37 (Fig. 5⇓). There were also strong trends toward inhibition by LL-37 of the IL-12 and TNF-α response to IFN-γ (p = 0.08 and p = 0.054, respectively; Fig. 5⇓). These results suggest that LL-37 may inhibit the induction and activities of classically activated macrophages, which in vitro are typically induced by IFN-γ and LPS (32). LL-37-mediated suppression of IFN-γ and LPS responses in a RAW 264.7 macrophage cell line. RAW/pIL12-GFP cells were either stimulated simultaneously with LPS (10 ng/ml) and IFN-γ (10 ng/ml) for 24 h, or primed with IFN-γ (10 ng/ml) for 3 h and then washed and treated with LPS (10 ng/ml) for an additional 21 h. Both stimulations were performed with (gray line) or without (black line) LL-37 (20 μg/ml), added together with IFN-γ. A and B, LL-37 inhibited IFN-γ- and LPS-induced IL-12 p40 promoter activity: A, histograms of GFP fluorescence representative of three to four independent experiments; B, bar charts of the mean fluorescence intensity of the cells following background subtraction. C, TNF-α production by the cells, measured by ELISA. All data from at least three independent experiments; bars represent means and SEs; ∗, p < 0.05; ∗∗∗, p < 0.001 using ANOVA; afu, arbitrary fluorescence units. IFN-γ is known to act directly on B lymphocytes, promoting costimulatory functions, proliferation, and plasma cell differentiation, and regulating Ab class switching (34, 35). Thus, the effects of LL-37 on IFN-γ responses were also investigated in B lymphocytes. Mouse splenocytes were stimulated with IFN-γ and LPS, with or without LL-37, for 18 h, and the induction of the activation markers CD80, CD86, and CD69 was measured by flow cytometry gating on B220+/CD45R+ B cells. Although LL-37 strongly inhibited B cell activation in response to LPS and LPS plus IFN-γ, no inhibition of the response to IFN-γ alone was observed (Fig. 6⇓). Similar patterns of inhibition were seen for both the CD86 and CD69 activation markers (Fig. 6⇓), whereas no induction of CD80 was seen with any of the treatments (data not shown). Effects of LL-37 on IFN-γ- and LPS-induced activation of splenic B cells. Mouse splenocytes were stimulated ex vivo for 18 h with IFN-γ (50 ng/ml) and LPS (100 ng/ml), with (gray line) or without (black line) LL-37 (20 μg/ml), and analyzed for the expression of activation markers CD69 and CD86 by flow cytometry, gating on B220+ B cells. A, Histograms of CD69 and CD86 expression on splenic B cells, representative of four biological replicates, and B, bar charts comparing the histogram mean fluorescence intensities. Bars represent means and SEs of the mean; statistical analysis using ANOVA; ∗, p < 0.05; ∗∗, p < 0.01; ∗∗∗, p < 0.001; AFU, arbitrary fluorescence units. Over a longer time course and higher concentration range, LPS and IFN-γ also stimulate ex vivo B cell proliferation (34, 35). To investigate the effects of LL-37 on this activity, the numbers of B220+(CD45R+) B cells were measured in culture following a 5-day stimulation with LPS and IFN-γ, with or without the addition of LL-37. It was observed that LL-37 significantly inhibited LPS- and LPS plus IFN-γ-induced B cell proliferation (Fig. 7⇓A); however, no splenocyte proliferation was seen in response to the IFN-γ treatment alone. To further investigate the inhibitory activity of LL-37 on IFN-γ responses in B cells, IFN-γ priming was performed. The cells were primed with IFN-γ with or without LL-37 for 2 days, washed, and stimulated with LPS for an additional 3 days, and the numbers of B cells in the cultures were measured. Under this protocol, LL-37 also significantly inhibited B cell proliferation, suppressing IFN-γ priming (Fig. 7⇓A). The proliferation of B cells was further assessed using CFSE labeling, with CFSE dilution being indicative of cell proliferation. CFSE fluorescence of the B220+(CD45R+) B cells was measured at day 5 of in vitro stimulation, and again, significant inhibition of LPS plus IFN-γ-induced B cell proliferation was observed in the presence of LL-37 (Fig. 7⇓B). LL-37 inhibition of IFN-γ- and LPS-induced in vitro proliferation and class switching of splenic B cells. Mouse splenocytes were stimulated ex vivo for 5 days with IFN-γ (50 ng/ml) and LPS (1 μg/ml), with and without LL-37 (20 μg/ml). In the IFN-γ-priming experiment, the cells were primed with IFN-γ (50 ng/ml) with or without LL-37 (20 μg/ml) for 2 days, and then washed and stimulated with LPS (1 μg/ml) for an additional 3 days. A, Total numbers of viable B cells in the cultures at day 5. B, B cell proliferation assessed by CFSE labeling: percentage of CFSE-low B cells at day 5 of stimulation; B cells were gated as B220+ and CFSE dilution is indicative of cell proliferation; the histograms represent stimulation with LPS plus IFN-γ alone (black line) or in the presence of LL-37 (gray line). C and D, Levels of the IgM and IgG2a Ab isotypes at day 5 of stimulation. The data are from n ≥ 3 biological replicates; bars represent means and SEs of the mean; ∗, p < 0.05 using Student’s t test. LPS alone or in combination with IFN-γ is also known to promote plasmablast differentiation, Ab secretion, and Ig class switching in B cells in culture and in vivo (35, 45). Although LPS induces B cells to switch from IgM to IgG3 Ab isotype production, in the presence of LPS and IFN-γ the cells are polarized toward Th1-type IgG2a Ab production. Therefore, the effects of LL-37 on the production of different Ab isotypes in response to LPS and LPS plus IFN-γ stimulation were measured. The cells were either continuously stimulated with LPS plus IFN-γ for 5 days, or in a separate experiment primed with IFN-γ for 2 days, followed by a 3-day LPS stimulation. Ab secretion and the relative production of different Ab isotypes were measured by ELISA. Although IFN-γ did not promote Ab responses by itself, it synergistically up-regulated Ab production and IgG2a class switching in combination with LPS. Both of these activities were significantly inhibited by LL-37 (Fig. 7⇑C). Furthermore, using the IFN-γ-priming protocol, a significant inhibition of IgM production and a strong trend (p = 0.10; Student’s t test) toward inhibition of IgG2a production were also observed (Fig. 7⇑D). In summary, this demonstrated that inhibitory activities of LL-37 on IFN-γ responses are not restricted to myeloid cells of the innate immune system and that LL-37 may play a role in regulating IFN-γ responses also in lymphocytes and during the adaptive phase of immune response. IFN-γ signals through the IFN-γ receptor and the JAK-STAT signaling pathway, with the phosphorylation, dimerization, and activation of STAT1 transcription factors being one of the main downstream signaling responses (29). To understand the molecular basis for the inhibitory effects of LL-37 on IFN-γ activity, the effects of LL-37 on the JAK-dependent STAT1-Y701 phosphorylation were assessed. PBMCs were stimulated over a 2-h time course with IFN-γ, stained for STAT1-pY701, and analyzed by flow cytometry gating on the CD14+ monocytes. Surprisingly, LL-37 did not affect IFN-γ-induced STAT1-Y701 phosphorylation, with neither the strength nor the dynamics of the response being affected (Fig. 8⇓A). Similarly, LL-37 did not inhibit STAT1-Y701 phosphorylation in response to IFN-γ plus LPS, and no induction of STAT1-Y701 phosphorylation was seen in response to the LPS treatment alone (Fig. 8⇓A). 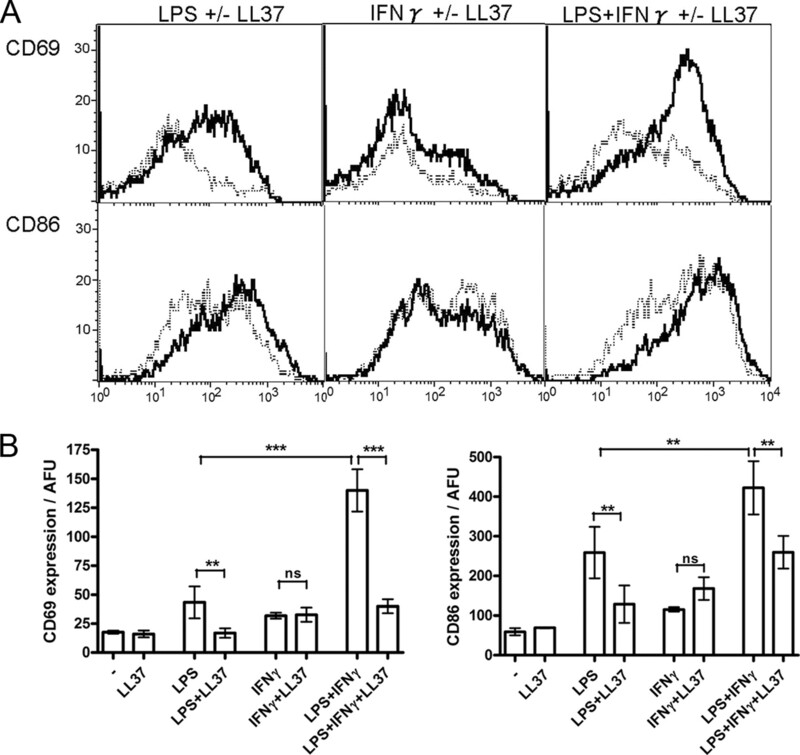 Effects of LL-37 on signaling responses to IFN-γ and LPS in human monocytes. PBMCs were stimulated with IFN-γ (25 ng/ml) and LPS (100 ng/ml) with or without LL-37 (20 μg/ml) over the 0- to 120-min time course. The cells were analyzed by flow cytometry for phosphorylation of STAT1 Tyr701 (A), STAT1 Ser727 (B), p65 NF-κB Ser529 (C), and MAPK p38 Thr180/Tyr182 (D), selectively gating on CD14+ monocytes. The data are expressed as fold change in the mean fluorescence intensity of the phospho-specific Ab staining of stimulated vs unstimulated control cells. Data are from four independent experiments; statistical comparison by ANOVA; ∗, p < 0.05; ∗∗, p < 0.01; ∗∗∗, p < 0.001. STAT1 also undergoes JAK-independent phosphorylation on S727, and a simultaneous phosphorylation of both Y701 and S727 is necessary for complete activation of its transcriptional activity (46, 47). Thus, the effects of LL-37 on STAT1-S727 phosphorylation were also analyzed. LL-37 significantly inhibited STAT1-S727 phosphorylation in response to LPS and the combined IFN-γ plus LPS treatment (Fig. 8⇑B), indicating that this may be one of the mechanisms underlying the suppression of LPS plus IFN-γ synergistic activity by the peptide. However, no effect was seen on the STAT1-S727 phosphorylation in response to IFN-γ alone (Fig. 8⇑B). This demonstrated that the suppression of IFN-γ responses by LL-37 in monocytes was not mediated through inhibition of STAT1 phosphorylation. IFN-γ is also known to induce a number of other, less well-characterized, STAT1-independent signaling responses, including the activation of MAPK and NF-κB pathways (30, 31, 48). Thus, the effects of LL-37 on the IFN-γ-induced phosphorylation and activation of p65-NF-κB-S529 and p38-MAPK T180/Y182 were analyzed. LL-37 significantly inhibited the induction of both p65 NF-κB and p38 MAPK phosphorylation in response to IFN-γ in a time-dependent fashion (Fig. 8⇑, C and D). Furthermore, LL-37 also strongly inhibited the induction of these signaling responses by LPS and the combined IFN-γ plus LPS treatment (Fig. 8⇑, C and D). This indicates that the inhibitory effects of LL-37 on IFN-γ activity in monocytes are mediated, at least in part, through the suppression of STAT1-independent signaling events, such as the MAPK and NF-κB pathway activities. The molecular mechanisms mediating these effects are not fully understood and may represent compensatory up-regulation of other signaling pathways that antagonize NF-κB and MAPK signaling. Over a longer time course, these changes may be reinforced through transcriptional up-regulation of negative regulators of NF-κB and MAPK signaling, including TNF-α-induced protein 3 (A20), reticuloendotheliosis viral oncogene homologue B, dual-specificity phosphatases, and anti-inflammatory secreted factors such as IL-10 (6). In this work, we have demonstrated that human cathelicidin peptide LL-37 modulated the activity of cytokine IFN-γ on a variety of cell types, including monocytes, macrophages, dendritic cells, and B lymphocytes. LL-37 also strongly inhibited the IFN-γ priming of LPS responses and the synergistic responses to a combined treatment with IFN-γ and LPS. Given the central role of IFN-γ in innate and adaptive immunity and the presence of LL-37 at modest concentrations normally and at high concentrations in inflamed tissues, it seems likely that this modulation of IFN-γ responses might have important implications in both innate and adaptive immune responses. In innate immunity, LL-37 modulation of IFN-γ may be part of the system for dampening down initial innate immune responses, especially for intracellular pathogens, to prevent excessive inflammation. This study also indicates that LL-37 strongly impacts on the adaptive immune response in a manner other than through conditioning or modulation of dendritic cells. Our results indicate that the suppression of IFN-γ responses by LL-37, at least in monocytes, was not linked to inhibition of the canonical JAK1/2-STAT1 signaling pathway, but was instead associated with inhibition of the p38 MAPK and p65 NF-κB STAT1-independent signaling responses. The role of STAT1-independent pathways in IFN-γ activity was previously established based on the IFN-γ responsiveness of STAT1-null cells; however, their exact nature and functions are poorly understood (30, 31, 48). Microarray analysis of STAT1-null macrophages previously showed some broad functional differences between STAT1-dependent and independent IFN-γ activities, such as the role of STAT1-independent pathways in the antiproliferative effects of IFN-γ on macrophages and in the induction of leukocyte adhesion (30, 48). Thus, the selective suppression of STAT1-independent pathways by LL-37 may have regulatory effects, resulting in selective modulation of some IFN-γ responses rather than in their broad suppression. This will be further complicated by the fact that the roles and relative activities of STAT1-dependent and independent pathways will differ in different cell types or based on the cell activation status, for example, due to regulated changes in STAT1 expression (30, 48). We showed that LL-37 inhibited the activities of IFN-γ on B cells; this is one of the first reports of an immunomodulatory activity of LL-37 on lymphocytes and suggests that LL-37 may have direct effects on adaptive immunity. This seemingly contrasts the previously reported role of LL-37 in promoting dendritic cell functions and the in vivo adjuvant activities of LL-37 and its mouse orthologue cathelin-related antimicrobial peptide (49, 50). However, it is important to note that whereas the dampening down of specific cytokines is often taken to represent an inhibitory response, it is safer to describe such effects as modulatory because the impact on the entire immune network rather than individual outputs needs to be defined to completely understand the outcomes of such interventions. The ability of LL-37 to promote Ag-specific immunity (as an adjuvant) at the same time as dampening IFN-γ activity on B cells mirrors its activities in innate immunity, in which it dampens TLR responses while still promoting resolution of infections. Interestingly, several studies described the ability of LL-37 to promote IFN-γ production. For example, LL-37 pretreatment of monocytes can promote in vitro differentiation of dendritic cells with stronger propensity to prime Th1 immunity, including T cell IFN-γ production (16); LL-37 can also promote IFN-γ production by NK cells in response to CpG oligonucleotides (51). Thus, the effects of LL-37 on IFN-γ responses may represent a balancing role in promoting IFN-γ production while down-regulating some of its effector functions. The relative roles of different LL-37 activities may also differ in different physiological locations. For example, the levels and activities of LL-37 are best characterized at mucosal surfaces, where immunity is biased toward non-Th1 humoral responses and IgA Ab production (52, 53, 54), and LL-37 may act to maintain homeostasis and prevent inappropriate Th1 responses to commensals or innocuous Ags from the environment. IFN-γ also plays a role in the pathology of several inflammatory diseases, and the effects of LL-37 on these remain to be explored. For example, IFN-γ has been implicated in the pathogenesis of cerebral malaria, and anti-IFN-γ mAbs can protect against the disease in murine models (23, 24, 55). The involvement of IFN-γ in sepsis is multifaceted: increased levels of IFN-γ during the induction of endotoxemia and sepsis strongly exacerbate disease progression (25, 26, 27, 28); however, there is some evidence that during the later stages of endotoxemia, IFN-γ can alleviate immune paralysis and improve survival (56), and indeed IFN-γ can prevent and reverse LPS tolerance in vitro (57). The gene encoding IFN-γ is also located in one of the susceptibility loci for ulcerative colitis (58). The possible physiological roles of LL-37 in modulating IFN-γ activities in these inflammatory conditions remain to be explored. Furthermore, the activities of the different proteolytically processed and truncated forms of the cathelicidin found in the human skin (59, 60) on IFN-γ responses remain to be investigated, and it remains possible that a loss of IFN-γ inhibitory activity may be one of the factors responsible for the links between some forms of LL-37 proteolytic processing and inflammatory conditions. There is increasing interest in using the microbicidal and immunomodulatory properties of host defense peptides for therapeutic applications, with a number of peptide-based therapeutics undergoing clinical trials worldwide (61). The current trials mainly focus on the topical treatment of bacterial infections, although the development of peptide-based therapeutics for other conditions such as inflammatory diseases is under investigation (62). The inhibition of IFN-γ activity is a new facet of the complex immunomodulatory properties of host defense peptides that needs to be taken into consideration in their development as therapeutics. At present it is unknown whether this property is restricted to LL-37 or shared by other natural and synthetic cationic peptides, and a detailed characterization of the sequence requirements and structural basis of this activity would be of great interest. The potential for developing peptides with stronger IFN-γ antagonistic activities for therapeutic applications remains to be explored. 1 This work was supported by the Canadian Institutes for Health Research, the Foundation for the National Institutes of Health, and the Bill and Melinda Gates Foundation, through two separate grants from the Grand Challenges in Global Health Initiative. A.N. was supported by postdoctoral fellowships from the Canadian Institutes for Health Research and the Michael Smith Foundation for Health Research. R.E.W.H. is the recipient of a Canada Research Chair. 2 This work is dedicated to the memory of our valued colleague Aaron Wyatt, who tragically passed away in a car accident on December 24, 2008. 4 Abbreviations used in this paper: LTA, lipoteichoic acid; MDP, muramyl dipeptide; NOD-2, nucleotide-binding oligomerization domain-containing 2. Zanetti, M.. 2004. Cathelicidins, multifunctional peptides of the innate immunity. J. Leukocyte Biol. 75: 39-48. Durr, U. H., U. S. Sudheendra, A. Ramamoorthy. 2006. LL-37, the only human member of the cathelicidin family of antimicrobial peptides. Biochim. Biophys. Acta 1758: 1408-1425. Nijnik, A., R. E. W. Hancock. 2009. The roles of cathelicidin LL-37 in immune defenses and novel clinical applications. Curr. Opin. Hematol. 16: 41-47. Niyonsaba, F., K. Iwabuchi, A. Someya, M. Hirata, H. Matsuda, H. Ogawa, I. Nagaoka. 2002. A cathelicidin family of human antibacterial peptide LL-37 induces mast cell chemotaxis. Immunology 106: 20-26. Mookherjee, N., K. L. Brown, D. M. Bowdish, S. Doria, R. Falsafi, K. Hokamp, F. M. Roche, R. Mu, G. H. Doho, J. Pistolic, et al 2006. Modulation of the TLR-mediated inflammatory response by the endogenous human host defense peptide LL-37. J. Immunol. 176: 2455-2464. Niyonsaba, F., A. Someya, M. Hirata, H. Ogawa, I. Nagaoka. 2001. Evaluation of the effects of peptide antibiotics human β-defensins-1/-2 and LL-37 on histamine release and prostaglandin D2 production from mast cells. Eur. J. Immunol. 31: 1066-1075. Zheng, Y., F. Niyonsaba, H. Ushio, I. Nagaoka, S. Ikeda, K. Okumura, H. Ogawa. 2007. Cathelicidin LL-37 induces the generation of reactive oxygen species and release of human α-defensins from neutrophils. Br. J. Dermatol. 157: 1124-1131. Barlow, P. G., Y. Li, T. S. Wilkinson, D. M. Bowdish, Y. E. Lau, C. Cosseau, C. Haslett, A. J. Simpson, R. E. W. Hancock, D. J. Davidson. 2006. The human cationic host defense peptide LL-37 mediates contrasting effects on apoptotic pathways in different primary cells of the innate immune system. J. Leukocyte Biol. 80: 509-520. Nagaoka, I., H. Tamura, M. Hirata. 2006. An antimicrobial cathelicidin peptide, human CAP18/LL-37, suppresses neutrophil apoptosis via the activation of formyl-peptide receptor-like 1 and P2X7. J. Immunol. 176: 3044-3052. Scott, M. G., D. J. Davidson, M. R. Gold, D. Bowdish, R. E. W. Hancock. 2002. The human antimicrobial peptide LL-37 is a multifunctional modulator of innate immune responses. J. Immunol. 169: 3883-3891. Di Nardo, A., M. H. Braff, K. R. Taylor, C. Na, R. D. Granstein, J. E. McInturff, S. Krutzik, R. L. Modlin, R. L. Gallo. 2007. Cathelicidin antimicrobial peptides block dendritic cell TLR4 activation and allergic contact sensitization. J. Immunol. 178: 1829-1834. Kandler, K., R. Shaykhiev, P. Kleemann, F. Klescz, M. Lohoff, C. Vogelmeier, R. Bals. 2006. The anti-microbial peptide LL-37 inhibits the activation of dendritic cells by TLR ligands. Int. Immunol. 18: 1729-1736. Lande, R., J. Gregorio, V. Facchinetti, B. Chatterjee, Y. H. Wang, B. Homey, W. Cao, Y. H. Wang, B. Su, F. O. Nestle, et al 2007. Plasmacytoid dendritic cells sense self-DNA coupled with antimicrobial peptide. Nature 449: 564-569. Davidson, D. J., A. J. Currie, G. S. Reid, D. M. Bowdish, K. L. MacDonald, R. C. Ma, R. E. W. Hancock, D. P. Speert. 2004. The cationic antimicrobial peptide LL-37 modulates dendritic cell differentiation and dendritic cell-induced T cell polarization. J. Immunol. 172: 1146-1156. Pulendran, B., K. Palucka, J. Banchereau. 2001. Sensing pathogens and tuning immune responses. Science 293: 253-256. Yu, J., N. Mookherjee, K. Wee, D. M. Bowdish, J. Pistolic, Y. Li, L. Rehaume, R. E. W. Hancock. 2007. Host defense peptide LL-37, in synergy with inflammatory mediator IL-1β, augments immune responses by multiple pathways. J. Immunol. 179: 7684-7691. Bowdish, D. M., D. J. Davidson, D. P. Speert, R. E. W. Hancock. 2004. The human cationic peptide LL-37 induces activation of the extracellular signal-regulated kinase and p38 kinase pathways in primary human monocytes. J. Immunol. 172: 3758-3765. Leon, M. L., S. H. Zuckerman. 2005. γ Interferon: a central mediator in atherosclerosis. Inflamm. Res. 54: 395-411. Miu, J., N. H. Hunt, H. J. Ball. 2008. Predominance of interferon-related responses in the brain during murine malaria, as identified by microarray analysis. Infect. Immun. 76: 1812-1824. Yin, K., E. Gribbin, H. Wang. 2005. Interferon-γ inhibition attenuates lethality after cecal ligation and puncture in rats: implication of high mobility group box-1. Shock 24: 396-401. Spiller, S., G. Elson, R. Ferstl, S. Dreher, T. Mueller, M. Freudenberg, B. Daubeuf, H. Wagner, C. J. Kirschning. 2008. TLR4-induced IFN-γ production increases TLR2 sensitivity and drives Gram-negative sepsis in mice. J. Exp. Med. 205: 1747-1754. Doherty, G. M., J. R. Lange, H. N. Langstein, H. R. Alexander, C. M. Buresh, J. A. Norton. 1992. Evidence for IFN-γ as a mediator of the lethality of endotoxin and tumor necrosis factor-α. J. Immunol. 149: 1666-1670. Heremans, H., J. Van Damme, C. Dillen, R. Dijkmans, A. Billiau. 1990. Interferon γ, a mediator of lethal lipopolysaccharide-induced Shwartzman-like shock reactions in mice. J. Exp. Med. 171: 1853-1869. Ramana, C. V., M. P. Gil, R. D. Schreiber, G. R. Stark. 2002. Stat1-dependent and -independent pathways in IFN-γ-dependent signaling. Trends Immunol. 23: 96-101. Ramana, C. V., M. P. Gil, Y. Han, R. M. Ransohoff, R. D. Schreiber, G. R. Stark. 2001. Stat1-independent regulation of gene expression in response to IFN-γ. Proc. Natl. Acad. Sci. USA 98: 6674-6679. Szabo, S. J., B. M. Sullivan, S. L. Peng, L. H. Glimcher. 2003. Molecular mechanisms regulating Th1 immune responses. Annu. Rev. Immunol. 21: 713-758. Sidman, C. L., J. D. Marshall, L. D. Shultz, P. W. Gray, H. M. Johnson. 1984. γ-Interferon is one of several direct B cell-maturing lymphokines. Nature 309: 801-804. Snapper, C. M., C. Peschel, W. E. Paul. 1988. IFN-γ stimulates IgG2a secretion by murine B cells stimulated with bacterial lipopolysaccharide. J. Immunol. 140: 2121-2127. Schroder, K., M. J. Sweet, D. A. Hume. 2006. Signal integration between IFNγ and TLR signalling pathways in macrophages. Immunobiology 211: 511-524. Held, T. K., X. Weihua, L. Yuan, D. V. Kalvakolanu, A. S. Cross. 1999. γ Interferon augments macrophage activation by lipopolysaccharide by two distinct mechanisms, at the signal transduction level and via an autocrine mechanism involving tumor necrosis factor α and interleukin-1. Infect. Immun. 67: 206-212. Kovarik, P., D. Stoiber, M. Novy, T. Decker. 1998. Stat1 combines signals derived from IFN-γ and LPS receptors during macrophage activation. EMBO J. 17: 3660-3668. Dao, D. N., L. Kremer, Y. Guerardel, A. Molano, W. R. Jacobs, Jr, S. A. Porcelli, V. Briken. 2004. Mycobacterium tuberculosis lipomannan induces apoptosis and interleukin-12 production in macrophages. Infect. Immun. 72: 2067-2074. Darveau, R. P., R. E. W. Hancock. 1983. Procedure for isolation of bacterial lipopolysaccharides from both smooth and rough Pseudomonas aeruginosa and Salmonella typhimurium strains. J. Bacteriol. 155: 831-838. Della Bella, S., S. Giannelli, A. Taddeo, P. Presicce, M. L. Villa. 2008. Application of six-color flow cytometry for the assessment of dendritic cell responses in whole blood assays. J. Immunol. Methods 339: 153-164. Sansom, D. M., C. N. Manzotti, Y. Zheng. 2003. What’s the difference between CD80 and CD86?. Trends Immunol. 24: 314-319. Bhatia, S., M. Edidin, S. C. Almo, S. G. Nathenson. 2006. B7-1 and B7-2: similar costimulatory ligands with different biochemical, oligomeric and signaling properties. Immunol. Lett. 104: 70-75. Kagan, J. C., T. Su, T. Horng, A. Chow, S. Akira, R. Medzhitov. 2008. TRAM couples endocytosis of Toll-like receptor 4 to the induction of interferon-β. Nat. Immunol. 9: 361-368. Stavnezer, J., J. E. Guikema, C. E. Schrader. 2008. Mechanism and regulation of class switch recombination. Annu. Rev. Immunol. 26: 261-292. Goh, K. C., S. J. Haque, B. R. Williams. 1999. p38 MAP kinase is required for STAT1 serine phosphorylation and transcriptional activation induced by interferons. EMBO J. 18: 5601-5608. Varinou, L., K. Ramsauer, M. Karaghiosoff, T. Kolbe, K. Pfeffer, M. Muller, T. Decker. 2003. Phosphorylation of the Stat1 transactivation domain is required for full-fledged IFN-γ-dependent innate immunity. Immunity 19: 793-802. Gough, D. J., D. E. Levy, R. W. Johnstone, C. J. Clarke. 2008. IFNγ signaling: does it mean JAK-STAT?. Cytokine Growth Factor Rev. 19: 383-394. An, L. L., Y. H. Yang, X. T. Ma, Y. M. Lin, G. Li, Y. H. Song, K. F. Wu. 2005. LL-37 enhances adaptive antitumor immune response in a murine model when genetically fused with M-CSFR (J6-1) DNA vaccine. Leuk. Res. 29: 535-543. Kurosaka, K., Q. Chen, F. Yarovinsky, J. J. Oppenheim, D. Yang. 2005. Mouse cathelin-related antimicrobial peptide chemoattracts leukocytes using formyl peptide receptor-like 1/mouse formyl peptide receptor-like 2 as the receptor and acts as an immune adjuvant. J. Immunol. 174: 6257-6265. Chuang, C. M., A. Monie, A. Wu, C. P. Mao, C. F. Hung. 2009. Treatment with LL-37 peptide enhances antitumor effects induced by CpG oligodeoxynucleotides against ovarian cancer. Hum. Gene Ther. 20: 303-313. Cerutti, A.. 2008. Location, location, location: B-cell differentiation in the gut lamina propria. Mucosal Immunol. 1: 8-10. Fagarasan, S., K. Kinoshita, M. Muramatsu, K. Ikuta, T. Honjo. 2001. In situ class switching and differentiation to IgA-producing cells in the gut lamina propria. Nature 413: 639-643. Fiset, P. O., L. Cameron, Q. Hamid. 2005. Local isotype switching to IgE in airway mucosa. J. Allergy Clin. Immunol. 116: 233-236. Hunt, N. H., G. E. Grau. 2003. Cytokines: accelerators and brakes in the pathogenesis of cerebral malaria. Trends Immunol. 24: 491-499. Moreno, S. E., J. C. Alves-Filho, T. M. Alfaya, J. S. da Silva, S. H. Ferreira, F. Y. Liew. 2006. IL-12, but not IL-18, is critical to neutrophil activation and resistance to polymicrobial sepsis induced by cecal ligation and puncture. J. Immunol. 177: 3218-3224. Randow, F., W. D. Docke, D. S. Bundschuh, T. Hartung, A. Wendel, H. D. Volk. 1997. In vitro prevention and reversal of lipopolysaccharide desensitization by IFN-γ, IL-12, and granulocyte-macrophage colony-stimulating factor. J. Immunol. 158: 2911-2918. Silverberg, M. S., J. H. Cho, J. D. Rioux, D. P. McGovern, J. Wu, V. Annese, J. P. Achkar, P. Goyette, R. Scott, W. Xu, et al 2009. Ulcerative colitis-risk loci on chromosomes 1p36 and 12q15 found by genome-wide association study. Nat. Genet. 41: 216-220. Yamasaki, K., A. Di Nardo, A. Bardan, M. Murakami, T. Ohtake, A. Coda, R. A. Dorschner, C. Bonnart, P. Descargues, A. Hovnanian, et al 2007. Increased serine protease activity and cathelicidin promotes skin inflammation in rosacea. Nat. Med. 13: 975-980. Hancock, R. E. W., H. G. Sahl. 2006. Antimicrobial and host-defense peptides as new anti-infective therapeutic strategies. Nat. Biotechnol. 24: 1551-1557. Mookherjee, N., L. M. Rehaume, R. E. W. Hancock. 2007. Cathelicidins and functional analogues as antisepsis molecules. Expert Opin. Ther. Targets 11: 993-1004.